← I want to scream – but nobody would hear me. Where did I leave you last. Ahh Mumbai. Well we finished that city with a $$$$ dinner at the Taj Hotel, which is in front of the “Gateway of India”. Extremely expensive. Although beautiful, our verdict was that the Mumbai cheap and cheerful restaurants had much better fare. At least our meal wasn’t interrupted by Muslim terrorists with machine guns. Pathetic really, but I was looking for bullet holes in the walls. There were none, of course. Now onto Holi. The biggest festival in India, that celebrates the arrival of spring. We flew into Jaipur last night. We had made a reservation at the Naila Bagh Palace. I’ll just mention now that a lot of hotels here go by the moniker of “Palace” and are a sad reflection of that royal term. Luck would have it that as our taxi turned off a dusty and rubbish-strewn Jaipur street, through the Palace’s gatehouse, it was a dinky-di palace. Luck didn’t stop there; the hotel was short a room (they only have twelve) and they upgraded us to a “Royal Suite”. The local royals (you won’t find them in Hello Magazine, they’re not *that* royal! ), have turned their palace into a hotel, and they live in the top level. So imagine, cavernous domed ceilings, Belgian chandeliers (I read the brochure), Indian and European antiques, family portraits of long-dead Maharajas, and photos of tiger hunting expeditions. Not very WWF, but very atmospheric all the same. Well to celebrate Holi, our Royal hosts decided to have a house party. So we were treated to an open bar, lots of curries, and a long table of coloured wonder. This long table held many round brass trays, each with a pyramid of vibrantly-coloured powder; deep purple, bright pink, saffron yellow, Yves Klein blue, fuscia, blood red, verdant green. All made from vegetable dye and wheat flour. Not very healthy for Mikey, my travelling coeliac. Tell you tomorrow if he kept his mouth closed enough while the poisonous powder was being thrown about. This celebration was held in the palace grounds beside the marble pool, with hotel guests and the local “who’s who” of Jaipur. The Holi festival tradition is that you initially rub the brilliantly-coloured powder on someone’s arm or face while greeting them with “Happy Holi”. Well, after a few drinks, and with children and water pistols involved it became messy, colourful (the pool water will never look the same) and lots of fun. Everyone became a melange of colour, to the point of not knowing if the person we were greeting was Indian or Western. Our hosts had a DJ belting out Bollywood and Western hits as we all danced and threw rainbow missiles at each other. On the Jaipur streets, where Mike and I ventured out looking like sad tie-dyed hippies in our “Holi” covered clothes, it was just the same. The streets were awash with good will and colour. So later, after a thorough scrubbing, our palace towels look like rainbows, our shirts look like they belong in the 70s, and Mike’s hair is blue/ purple/ pink (I hope the blue/ purple rinse isn’t a taste of things to come in our old age). It’s late afternoon. Mikey’s asleep. Too much Holi celebrations, and I’m heading there. 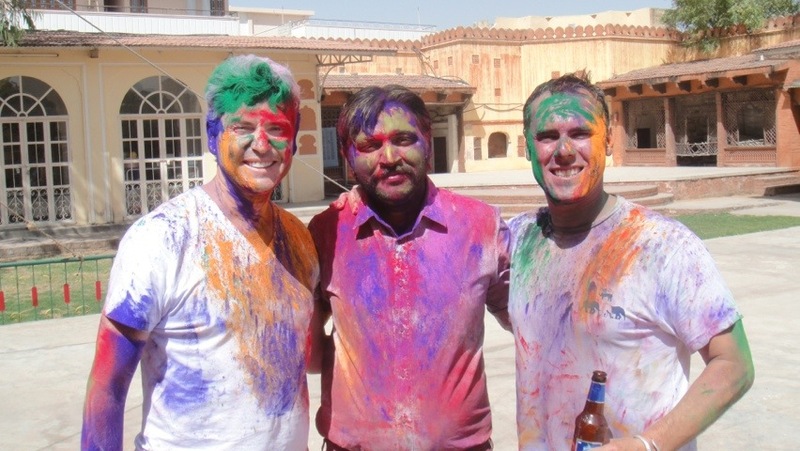 This entry was posted in India and tagged Holi, India, Jaipur, Naila Bagh Palace. Bookmark the permalink. 1 Response to Happy Holi! Kind of like Christmas, but not.